The U.N.'s top official for refugee affairs said Friday that granting citizenship to members of Myanmar's Muslim Rohingya minority is crucial for achieving peace in the country's western state of Rakhine, but economic development is also necessary. United Nations High Commissioner for Refugees Filippo Grandi spoke in Bangkok after an official visit to Myanmar. The Rohingya face severe discrimination in Buddhist-majority Myanmar and were the targets of violence in Rakhine in 2012 that killed hundreds and drove about 140,000 people — predominantly Rohingya — from their homes to displacement camps, where most remain. 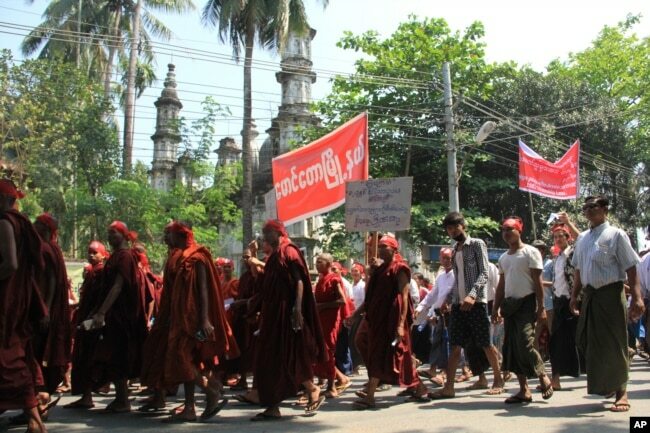 Hard-line Buddhists walk by a mosque during a protest march, led by Rakhine State's dominant Arakan National Party, against the government's plan to give citizenship to some persecuted Rohingya Muslims, March 19, 2017. The Rohingya have long been denied citizenship, freedom of movement and basic rights in Myanmar, where they are often seen as illegal immigrants from neighboring Bangladesh, although many have lived in the area for generations. Myanmar's Foreign Minister Aung San Suu Kyi waves her hand to Norway's Foreign Minister Borge Brende (not in picture) after their meeting at Myanmar's Foreign Ministry in Naypyitaw, Myanmar, July 6, 2017. 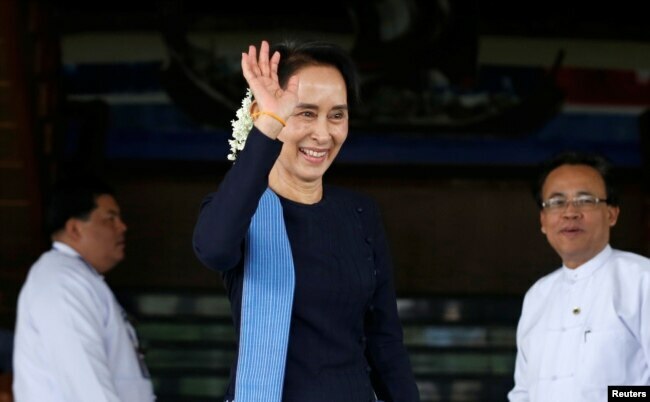 Grandi said he received assurances from Myanmar's top leader, Aung San Suu Kyi, that refugees from her country who have been sheltering in Thailand — many for decades — will be welcome back home. More than 100,000 refugees from Myanmar, virtually all from ethnic minorities, live in camps in Thailand near the border. Decades of fighting between the Myanmar army and ethnic guerrillas drove them to seek shelter in Thailand. The installation of Suu Kyi's civilian government last year after five decades of military-led rule has raised hopes they can go home, but intermittent fighting in many areas and the absence of a peace agreement have stalled large-scale repatriation. He said he also discussed the issue when he met with Thai Prime Minister Prayuth Chan-ocha and other Thai government officials. “We agreed that it was important to pursue, to continue, the return of refugees from Thailand to Myanmar,” Grandi said. Grandi next visits Bangladesh, which hosts hundreds of thousands of Rohingya from Myanmar who have entered since the 1970s.